Are you new to Pasadena, California? Maybe you’ve lived here for a long time but never really explored your own stomping ground. There are some amazing things to do in Pasadena, Ca. One of the must do’s is the Arlington Garden, it is the only dedicated public garden in the area. There are 25 park and wonderful open spaces in Arroyo Seco and Eaton Canyon but this is the only garden. The garden is a must visit for locals and visitors. If you are looking for an outdoors adventure then Henninger Campground it a wonderful campground with a beautiful pine forest. The 3 mile (one way) hike up Mount Wilson Toll Road to the Henninger Flats is a wonderful trek. You will find campgrounds, a tree nursery, hiking adventures, beautiful views, and steep mountain slopes overlooking San Gabriel Valley. If you want to see a 190-acre zoological, botanical, and geological nature preserve then Eaton Canyon Natural Area would be your next stop. This sits at the base of the San Gabriel Mountains and allows for picnics, sunsets, rocks and mineral hunting, as well as an array of wildlife. Brookside park is another good place especially for kids needing some outdoor activities. The park offers fitness trails, tennis courts, baseball fields, soccer overlays, football overlays, and playgrounds. Pasadena is also a great place to celebrate events like birthdays, quinceaneras, and weddings. 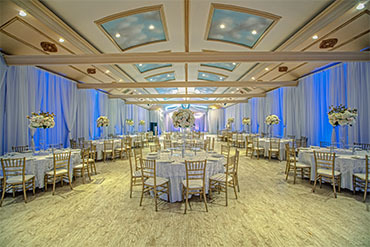 Pasadena offers affordable event rentals and banquet halls. MGM Banquet Hall is regarded as one of the best places to rent for all types of events.